Custom Air Products & Services, Inc. (CAPS), a leading commercial and industrial heating, ventilation, and air conditioning (HVAC) company, is proud to announce its latest line of industrial duty HVAC units specifically designed for use in rigorous, high ambient environments in excess of 131˚F (55˚C). CAPS truly has an inimitable product and service offering which very few companies in our industry have the reputation, knowledge, experience and engineering resources to provide custom solutions to our clients’ unique and ever-changing requirements. 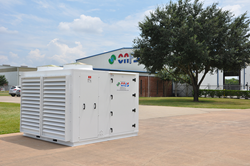 Custom Air Products & Services, Inc. (CAPS), a leading commercial and industrial heating, ventilation and air conditioning (HVAC) company based in Houston, Texas (US) has expanded its line of industrial duty HVAC units, specifically designed for rigorous high ambient environments like in the Middle East, South America, and Africa. The expanded line consists of units sized from 2 through 30 nominal tons capacity at 131˚F (55˚C) ambient operating temperature. These high ambient units are designed and built utilizing industrial grade components manufactured in the United States of America. The refrigeration system is designed to use environmentally-friendly R134A refrigerant, which is necessary to operate in extreme temperatures of 131˚F (55˚C) or greater. These units feature a ruggedized cabinet construction with two-inch Urethane insulation, which reduces solar-loading. EnergyGuard coil coatings are applied to reduce both erosion caused by sandstorms, and corrosion from the coastal environments. All of CAPS industrial high ambient package units operate utilizing state-of-the-art direct digital controls (DDC) in order to maintain precise temperature control. For well over a decade, CAPS has successfully manufactured hundreds of high ambient HVAC units to provide custom solutions to its clients all over the world. With equipment operating in fifty-two countries and on six continents, CAPS has designed and manufactured units that will withstand very difficult environments and extreme conditions. CAPS has recently completed fifty industrial high ambient units to be deployed to the Middle East. This custom solution is for one of the largest companies in the oil and gas sector. Extensive Factory Acceptance Testing (FAT) was completed on this prototype, as with every prototype, to ensure that all expectations were exceeded and every specification was met. Allan Taylor, Testing Manager, describes it in lamest terms: “We create the Formula 1 race cars of air conditioning.” Units created by Custom Air Products are powerful, and most importantly, reliable. Custom Air Products & Services currently occupies five (5) modern facilities, totaling 200,000 square feet in size. These buildings include administrative and engineering offices, training facilities, a filter warehouse, and service shops for fabrication, manufacturing, and modifications. CAPS services are provided to customers throughout the United States and Mexico while their manufactured products have been delivered to sites around the world.